A friend of mine from Munich complains that her hometown has been taken over by "schicki-mickis," as Germans call too-smooth city slickers who prefer Armani suits to lederhosen or dirndls. 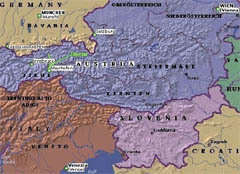 To see how Munichers relax and get back to their roots, she recommended that I head for the Chiemsee, at around 30 square miles the largest lake in Bavaria and a popular escape since "mad" King Ludwig II built one of his three fantasy castles on an island there in the 1870's. With a July weekend to spend in Bavaria and no desire to spend it among the schicki-mickis, I took her advice. While Ludwig's imposing creation is the main attraction, the clear waters of the Chiemsee (pronounced KEEM-zay) and the surrounding hills also offer plenty of options for swimming, boating, bicycling, hiking, windsurfing or fishing. While the local residents refer to the lake with a bit of overstatement, calling it the "Bavarian sea" (Lake George in upstate New York is about a third bigger), there is little Riviera-style glamour. On the other hand, the possibilities for beer-drinking in pleasant gardens are nearly endless. Prien, the major town in the region, with a year-round population of about 10,000, is a cheerful resort with hotels, restaurants and shops clustered around its train station, a mile or so west of the Chiemsee. In the part of town called Stock, a few hotels line the lakefront next to a ferry landing from which boats regularly crisscross the lake. Because time was short and I wanted to take advantage of the lake, I chose one of these. From my hotel, Luitpold am See, it was easy to catch one of the frequent ferries to the Herreninsel (details at www.herren -chiemsee.de), where Ludwig built his castle Herrenchiemsee. As I passed from the ferry stop through souvenir stands and into gardens manicured into the pattern of a Savonnerie rug, the palace appeared, a bizarre sight amid the chestnut and maple forests. It does indeed resemble Versailles, or at least a small chunk of it; because the imposing Herrenchiemsee was not completed, it lacks the wings and outbuildings that help give Versailles a sense of proportion. While the exterior of Herrenchiemsee is relatively straightforward architectural plagiarism, the inside is an über-Versailles so gaudy that even Marie Antoinette might have blushed. 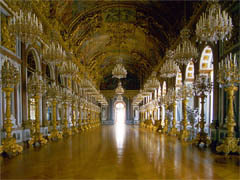 A half-hour guided tour pointed out the highlights, a series of rooms each more gold-encrusted than the last. Ludwig's bedroom is one of the most elaborate, befitting a king who preferred night to day and used his bed in lieu of a throne. He managed to spend only nine days at Herrenchiemsee, but it took workers more than a year of experimenting with the lighting of the bedroom to achieve the correct cast of blue. A shiny globe at the foot of the bed was used to diffuse candlelight into a melancholy nocturnal glow. Other kitschy gimmicks abound, some playful, some attesting to Ludwig's apparent agoraphobia. In one room, a cuckoo clock marks the hours — but instead of a bird, a miniature Louis XIV pops out. In the dining room, the table is set on a dumbwaiter built into a trapdoor, allowing servants to lift meals up from the room below to the king, who could dine in privacy. And like Versailles, Herrenchiemsee has a hall of mirrors, only bigger. Nearly 2,000 candles, on elaborate chandeliers and candelabras, were used to illuminate this over-the-top space, more likely to be used for costume parties than gatherings of state. 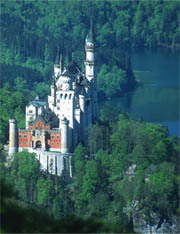 As costs spiraled out of control, only 20 of the 70 rooms that Ludwig planned were ever finished. 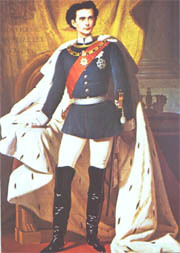 Munich power brokers, concerned about the decline of the Wittelsbach dynasty, which had ruled Bavaria for nearly eight centuries, finally removed him from the throne in 1886 after a psychiatric test found him unfit to rule, and Ludwig drowned later that year in suspicious circumstances in another Bavarian lake. From the ridiculous to the sublime: After the tour of the palace, I got back on the boat and headed for the neighboring island, the tiny Fraueninsel. A Benedictine convent on the island dating to the eighth century is still operating today, although it is closed to visitors. But a relaxing, mile-long walk around the island provided sumptuous views: the well-tended gardens of upscale second homes in the foreground, the onion-shaped dome of the convent's chapel tower behind them and the Alps on the horizon. I stopped for coffee in one of a handful of cafes; elsewhere, shops and restaurants advertised the catch from the lake, fresh or smoked. Though tradition is firmly entrenched in the Chiemsee area, the regional cuisine offers a welcome respite from the sausages, pork and knödel that still predominate in much of small-town Bavaria. That evening, back in Prien, I dined on grilled trout from the lake, simply but delicately prepared, at a lakeside restaurant in the Hotel Neuer am See. The handful of restaurants, bars and cafes along the lake in Stock quieted down by 11 p.m. As twilight faded over the Alps, the ferryboats, with names like the cast of a Wagner opera — Irmingard, Edeltraud, Berta — rested at anchor. Though I was told that some night life could be found in downtown Prien, I wasn't up for the 20-minute walk, and a 19th-century narrow-gauge steam train, built to shuttle tourists to the ferry landing, had stopped running earlier in the evening. Anyway, I had plans for more serious exercise the next day, a 45-mile bike ride around the lake. Cyclists are everywhere in and around Prien. There are mountain biking routes in the alpine foothills, well-maintained and marked dirt trails through nature preserves along the lake, and some lightly traveled roads that are good for riding. Rentals are available from shops all over town, and I was able to get a decent mountain bike for the day for about $12.50. I set off on a well-marked route around the lake, winding through the marshy, reedy terrain along the shore, with occasional turns into mossy evergreen forests or across rolling grazing fields. Except for a few short stretches, the trail avoided roads. At several points along the way to the next major town, Gstadt — also a stop on the ferry route — I stopped to catch my breath as the path wound its way down to small beaches or marinas. The lake is more an all-purpose summer destination than a beach resort, but there are a variety of small beaches — some sandy, some stony, with lots of grassy sunbathing spots; the water is clean and relatively warm for a lake in the foothills of the Alps. The route was well-traveled, though uncrowded, as most of the vacationers seemed to be more interested in taking a dip in the 72-degree water or just lazing around, admiring the view. By the time I made it to Seebruck, about a third of the way around the lake on its northern shore, hunger was setting in, so I stopped at a cafe with a terrace at the SeeHotel Wassermann. The pork I ordered arrived smothered in Gorgonzola cheese, a variation on the standard schweinsbraten, which usually is accompanied by a tangy gravy. A half-liter of beer is pretty much the obligatory accompaniment to such a meal on a Sunday afternoon in Bavaria. Unfortunately, its effects, combined with the meal, dissuaded me from another 30 miles of riding. Fortunately, the ferry stop in Gstadt was only about six miles away and bikes are allowed on the boats, making a variety of excursions possible. Forty-five minutes later, I was back in Prien and somewhat revived. My map showed that the hamlet of Urschalling, with a notable Romanesque chapel, was nearby; though the ride was up a steep hill, the effort was worth it. Not only are the timber-and-stucco farmhouses in Urschalling more beautiful than the vacation-home imitations along the lake, the tiny church of St. Jakobus is a real rarity north of the Alps. Though the outside looks conventionally Bavarian, with its onion dome and whitewashed walls, the interior, covered with primitive but striking frescoes, seemed to transport me to Italy. St. Jakobus, originally part of a fortress that no longer stands, was decorated twice, once in the 12th century and again in the 14th. Among the biblical scenes is an unusual depiction of the Holy Trinity, representing the Holy Spirit as a woman flanked by a father and son. The level of anatomical detail may have made the religious authorities uneasy — a reason, perhaps, why the frescoes were painted over in the 16th century and only came to light when the covering started to peel off in the 1920's. A teenager on the pilgrimage with his parents was wrongfully sent to the gallows after he rejected the amorous advances of an innkeeper's daughter, who spitefully planted a precious cup in his baggage and accused him of theft. The painting shows the boy as he appeared to his parents on their return from Santiago — wide-eyed and still full of life despite the noose around his neck, after St. Dominic came to his rescue. 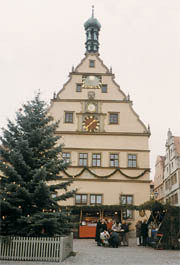 Hospitality is offered next door to the church at Mesner-Stub'n, a traditional inn and beer garden, by Simmerl, a Bavarian innkeeper from central casting: lederhosen, to be sure, but also a plumed felt hat, flowing beard, enormous pipe and on-cue wit about people from faraway lands like Prussia. Four years ago, Simmerl (real name: Simon Blank) handed the business down to his son, who served up an excellent smoked lake salmon, accompanied by rounds of the local lager in ceramic mugs. Through a small miracle, I survived the bike ride back to the hotel. 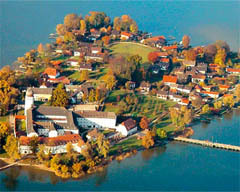 Most destinations around the lake are a little over an hour's drive from Munich or its airport. Many trains along the Munich-to-Salzburg line stop at Prien, the largest town in the region. Deutsche Bahn, the German federal railway, has information and online booking at reiseauskunft.bahn.de/bin/query.exe/en. 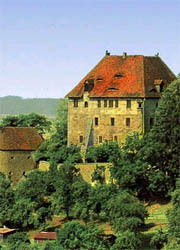 Although most accommodations in the area are in small guesthouses (gasthäuser) or vacation apartments, Prien has a variety of hotels in all ranges and makes the best base for sightseeing. There, the Hotel Luitpold am See, (49-8051) 609-100, fax (49-8051) 609-175, www.luitpold-am-see.de, where I stayed, is only steps from the ferry landing in the part of town called Stock. A narrow-gauge steam train links Stock to the main train station in downtown Prien, about a mile and a half away. The hotel seemed like a good value, with 54 clean, well-appointed rooms, all with private baths. There is also a pleasant cafe overlooking the small harbor. In high season, a double with bath is $115 to $145, at $1.25 to the euro. 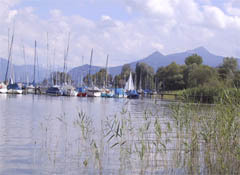 Also along the lakefront but away from the main cluster of hotels at Stock, is the more luxurious Yachthotel, (49-8051) 6960, fax (49-8051) 5171, www.yachthotel.de. The 102 rooms are modern and large, and there is a variety of spa facilities. A garden in the back looks out over a small marina. A double in high season is $188 to $212. Rib-sticking Bavarian fare like schweinsbraten (pork roast with gravy) and dumplings are never far away, but the specialty of the area is fresh fish from the Chiemsee. Huts along the lake, traditional and upscale restaurants all serve lake trout, salmon and other fish in a variety of ways — fried, sautéed or smoked. Though many restaurants seem to cater to the tour-bus crowd, Mesner-Stub'n in Urschalling, (49-8051) 3971, is a bit off the beaten path and worth it for well-prepared traditional dishes and atmosphere. Dinner for one runs about $25 with a drink. The restaurant at SeeHotel Wassermann in Seebruck, (49-8667) 8710, with a terrace overlooking the lake, makes a convenient stop during a bike tour of the area. About $25 with wine. On Fraueninsel, reachable by boat from Prien, several restaurants specialize in the local catch, which is served on terraces overlooking the water. The Inselwirt, (49-8054) 630, for example, serves lake salmon, whitefish and char in a variety of ways, including with a tasty mustard and white wine sauce. About $30 with wine.